Great combos, that hopefully will bring luck to everyone. Just a simple mini combo for today. that is perfect together! I also like the new clover for that it has only one lucky clover and the others are "regular"
Now that is what I would call a match made in heaven, beautiful Fleur! 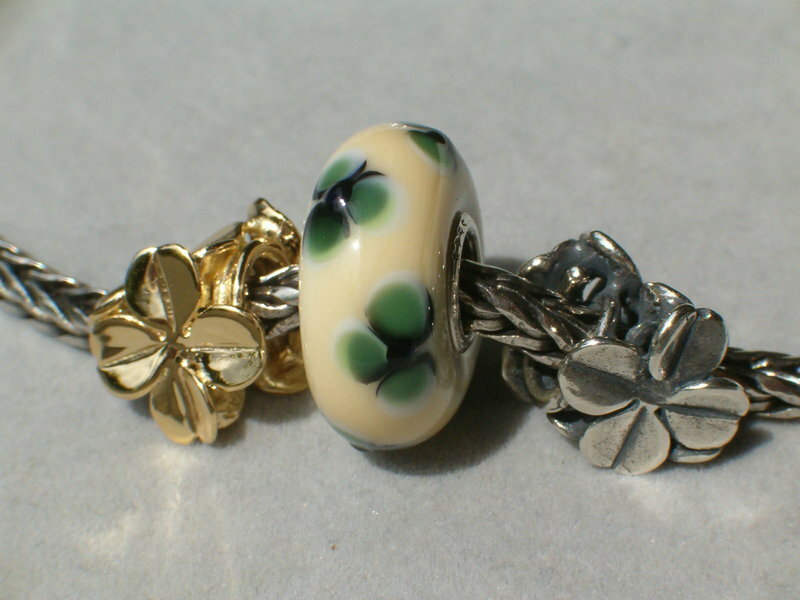 Cloverbead, your bracelet with the clovers and OAF is also very pretty. Nice to see some goldies all the pictures look lovely!! My bracelet arrived. 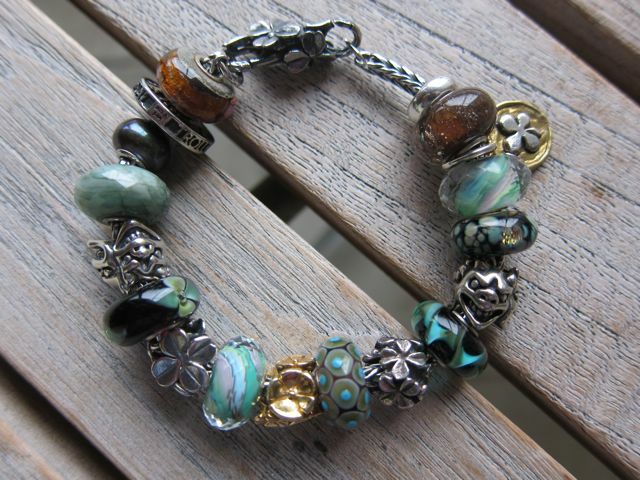 I really like the bead and even the lock. So much detail. The clover is so versatile and fun to combine. Blairkj, these ooak are stunning. Trollperle, the copper really adds to it. 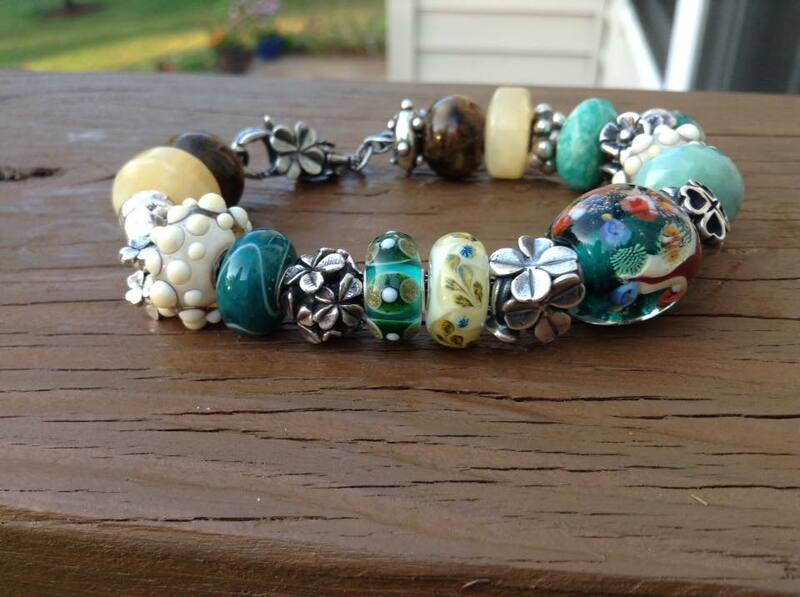 It's a fabulous mini combo only using Gold/silver/copper but not glass or stones. I've lately worn the two tone hydrangea with copper stoppers on a bangle. The only downside is the need of frequently polishing. I can't post photos from my iPad but I'll try and do it as soon as I get back from my travels. I'm off to Amsterdam for the weekend courtesy of my DD, celebrating a big wedding anniversary! Now all I need is a Svend Old Clover!!!! All gorgeous! I've been trying so hard to resist, but these beautiful bracelets are melting my resolve. 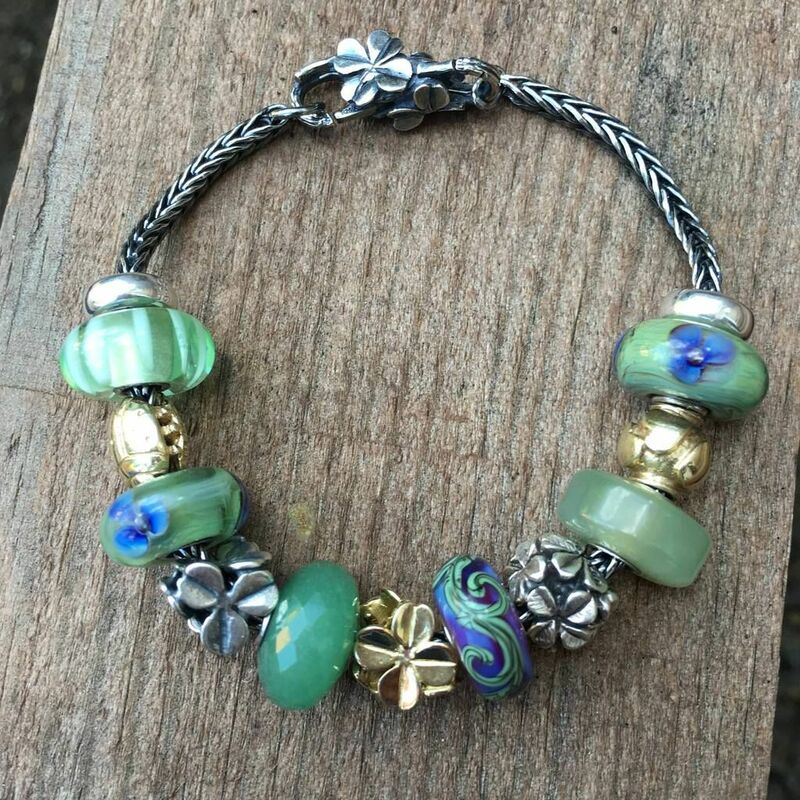 I love the clover but just don't need another bracelet. Here is mine with some of my favourite blue beads and a simple bangle, the clover bead sits nicely on the bangle , it just seems to wrap around it and is comfortable to wear. difficult, I am a bit like Reltan, trying to avoid loss of control, I surely don't want to start all over again. Lovely bracelets everyone...Yes this is what I am doing now Reltan and Catsworld: I have a small wishlist/plan and I'm only buying from there. If I buy it has to have a place e.g. I just bought curious kitten for my Alice- in- wonderland bracelet and hope at some point (maybe just before Christmas) to buy graceful crane for my family bracelet. I would also like star for my X. I'm still enjoying wearing my beads. Lovely to see everyone posting. I lost control definetely fault of this forum! I got the new jubilee bracelet, so far I could at least resist the gold clover but my lovely dealer has ordered it for me "just to have a look"
I love everybody's bracelets and good to see many come back. Life is too short to resist lovely beads... that's at least my opinion. 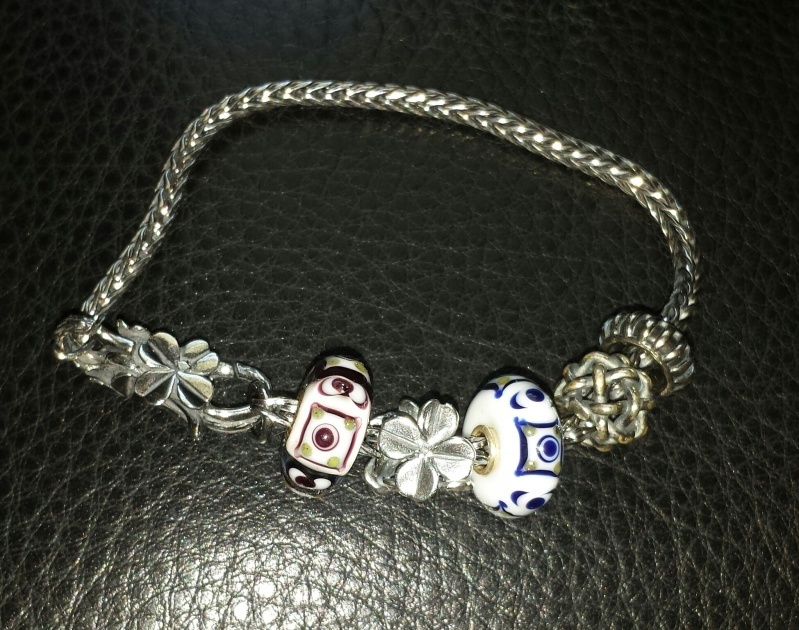 It always sheers me up on a not so sunny day to have some bead play... You need something positive to look for every day and arranging my bracelet in the morning is one of the positive things for me. I love how different and how beautiful everybody´s creations are - truly gorgeous!! !